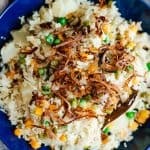 This pressure cooker veg pulao recipe is fragrant, fluffy and perfect every single time! Making this in an instant pot or any other pressure cooker ensures that everything cooks fast. Cooked with whole spices and lots of vegetables, this is the perfect side dish. There is no end to how much I love rice. We basically eat it as much as possible. Which means every single day. Twice a day. It’s mostly steamed rice but once in a while when the fancy strikes, I make this pressure cooker veg pulao. Which is luxurious, fancy, fragrant and so fluffy. You’ll see in the video below. Honestly I just love how satisfying rice can be – whether its long grain, short grain, moist, fluffy, broken. Yes I said moist because one of my favourite things to eat is overcooked rice with ladles of curry or dal on top. The rice becomes mushy and more porridge like and it’s the best kind of comfort food. I’m a little weird like that. This recipe has so many variations. And there are so many names for it – veg pulao, veg pulav, indian pulao – it doesn’t matter what you call it. It’s always a beautiful medley of vegetables, spices and long grained rice. From what I know, rice pilaf is different because its usually cooked in stock, which gives it a brown colour unlike this pressure cooker veg pulao which is more like an egg shell colour. What’s the difference between biryani and veg pulao? 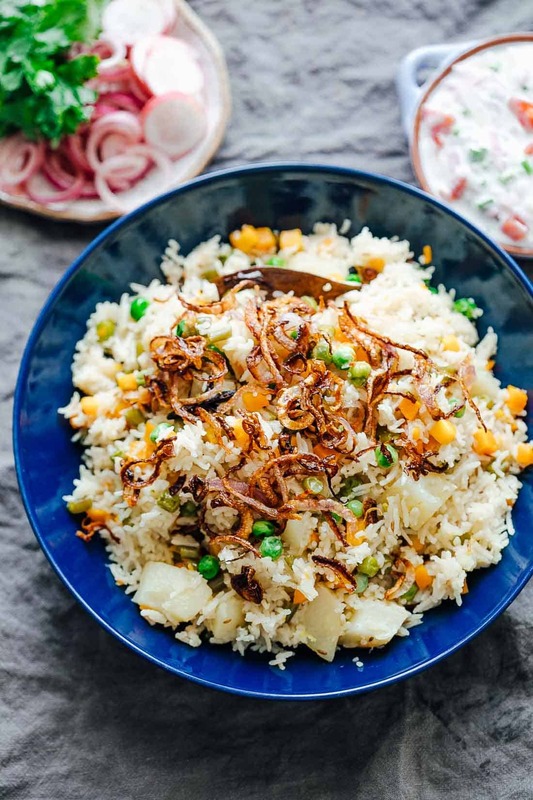 Veg Pulao is a simple recipe where rice and vegetables are sauteed together and then boiled or pressure cooked with water till the rice is fragrant, fluffy and cooked through. It’s a one pot dish where biryani is usually made by par cooking vegetables or meat which are then layered with rice and slow cooked. Frankly, veg pulao is the faster-to-make cousin of veg biryani, which is more labour intensive and a longer process. My mum makes a killer vegetable biryani and come to think about it, I should definitely share the recipe here for you guys! Soon, hopefully! Roast the Rice: Once you add the rice, roasting or sauteing it for a few minutes until the grains are coated, look slightly translucent and start smelling nutty helps keep the grains separate so that you don’t get clumps of rice. 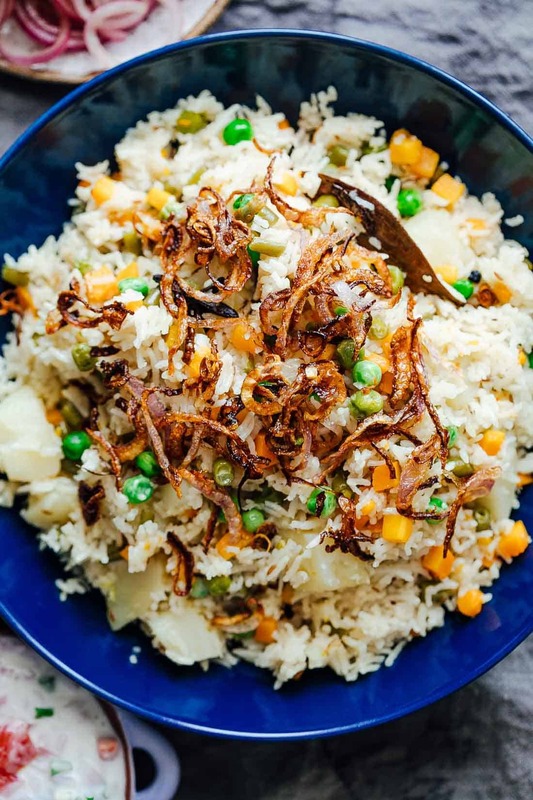 This step only takes 2-3 minutes but its the secret to making fluffy vegetable pulao. 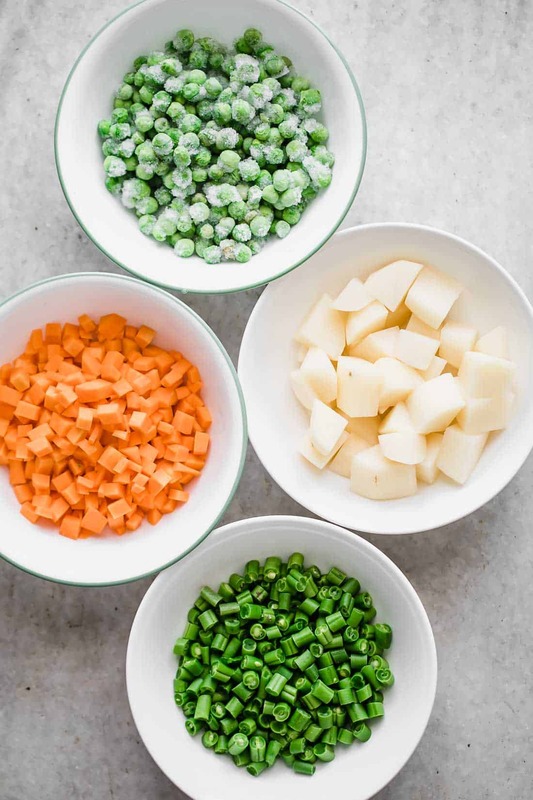 Don’t use par boiled vegetables: Sometimes frozen vegetables like carrots, beans or cauliflower can be parboiled before they are packaged. It’s important that the vegetables are not pre-cooked or they will turn to mush. Except green peas which hold their shape. 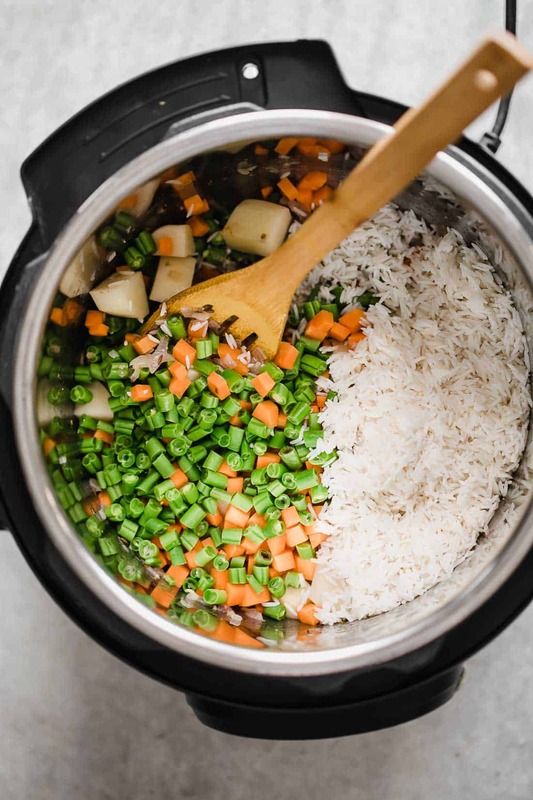 Water to Rice ratio: The general ratio for cooking rice is 2:1, but since we are pressure cooking the pulao, we are reducing it slightly here because the steam continues cooking the rice. This is definitely a super easy, one pot side dish recipe that never ever fails to satisfy, especially if you love rice as much as I do! Thanks Mohit – I hope you like it! This looks like it has so much flavor! I love all those veggies too! This rice looks like it was cooked perfect! Goodness, the flavors in this dish are incredible and the aroma from the spices made my mouth water. Since I have a brand new Instant Pot, I’ve been looking for great new recipes to try. This one is perfection! Just a quick scan through the ingredients list for this rice tells me that it’s absolutely delicious. I love that it’s an easier version of biryani (which I adore!). Thanks for the tips in the post – very useful! You got that so right – this recipe is perfect when the craving for biryani hits but you want something faster!